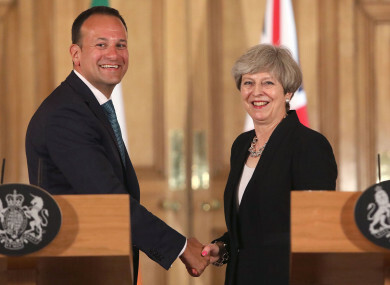 File photo dated 19/06/17 of Prime Minister Theresa May with Taoiseach Leo Varadkar. THE BRITISH GOVERNMENT is expected to release key Brexit policy papers in the next few weeks, according to The Guardian. The paper says that the documents are expected to cover topics such as the customs union and the Northern Irish border. The news comes as a new survey says that 77% of Irish exporters report ongoing uncertainty over Brexit is making it difficult to plan for the future, while just 3% of them have a plan in place for Britain’s exit from the EU. That’s according to the latest InterTradeIreland Business Monitor, which says that despite this, there is stability in the all-island economy, with little indication of direct negative impacts from prevailing uncertainty. According to its survey, 56% of firms are reporting they are ‘stable’ and 33% reported growth. But a year on from the Brexit vote, the Business Monitor suggests firms may now start to seek guidance on Brexit matters. More than a third of businesses with cross-border sales (36%) say they would welcome additional one-to-one support and almost a quarter of exporters (24%) want additional information on tariffs. While the stability experienced in the last quarter is described as “encouraging”, InterTradeIreland is advising businesses to start planning for Brexit to ensure they remain resilient in the face of future change. He said that InterTradeIreland is encouraging all businesses to plan, act and engage for every potential outcome, adding that it offers a Brexit advisory service. Gough said there is a “window of opportunity” for business, which “must now be grasped to prepare for the challenges and indeed the opportunities that will be presented by any new cross-border trade arrangements which may emerge over the coming years”. Meanwhile, Ibec, which represents Irish business, has published a set of briefs outlining the business priorities for each ministerial portfolio. Danny McCoy, CEO of Ibec, said that the publication is being launched “so as to ensure our reputation as a competitive and world-class business destination is maintained”. The document, which can be found here, says that the Taoiseach should secure commitments in any EU-UK deal “that recognises the unique economic and political challenges that Brexit presents to Ireland”. It says Leo Varadkar should also ensure that comprehensive transitional arrangements are put in place to “avoid a precarious ‘cliff edge’ scenario” and allow business time to adapt to a trading relationship. It also recommends that the Taoiseach “ensure a level playing field in relation to Ireland’s business tax offering for indigenous business”. The document also recommends that the Agriculture Minister support climate change policies that recognise the “sustainable grass-based food production system in Ireland” and the Minister for Communications stabilises the funding of public service broadcasting, such as adopting effective measures to combat television licence fee evasion. The Minister for Education is encouraged to implement a reform of the Junior and Leaving Certificate curriculums so that the emphasis is moved away from rote learning “towards a more holistic education experience”. Meanwhile, The Minister for Employment and Social Protection is advised to reform the private pension system. Email “UK to release its key Brexit policy papers 'in a few weeks'”. Feedback on “UK to release its key Brexit policy papers 'in a few weeks'”.